Ahoy, Dungeoneers! Long time no Blog! We’re pleased to announce the next three dates for The Critical Hit Show, including the date for our special Halloween Spooktacular! GET YOUR TICKETS RIGHT HERE! $6 advance, $9 at the door! Click to make me bigger! And just what have we been up to this past month? 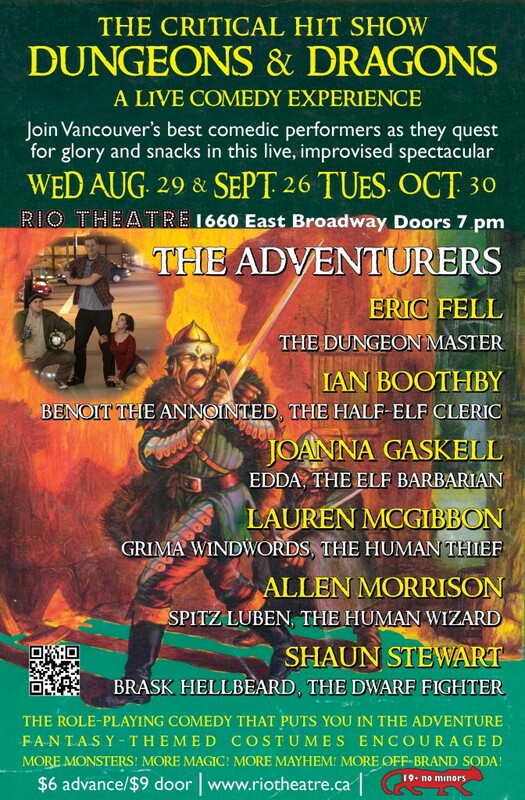 Shaun, Allen, and Eric did The Justice Pals Podcast, and developed and launched a show for the Vancouver TheatreSports League called iProv (with a special appearance by Jarrod himself, the amazing Brian Anderson)! Ian Boothby is doing another Titmouse show at The Kozmik Zoo and threw down THREE Sneaky Dragon Podcasts! Lauren McGibbon‘s improv and stand up awesomeness have been blowing audiences away from Vancouver to Kelowna! Oh, and she moved and had a wonderful cake at her housewarming party. Yum. Oh, and Eric made a horrific discovery at a Big Lots in Bellingham: Larry the Cable Guy Mac and Cheese. Stay tuned to the Twitter account for updates, and we’ll see you on August 29!